Donald Trump is a controversial and divisive figure within the US; he is even more so outside of the US. Part of this comes from his ideological and political incoherence; perhaps the only belief Trump has held consistently is that exports are good while imports are bad. Part of Trump’s unpopularity stems from his volatile and poisonous style of leadership. But are these two phenomena linked? Might Trump’s nativist style affect US exports? In this column, I argue that a strong linkage exists – Trump’s unpleasantness lowers US exports since foreigners choose to purchase imports from countries they prefer. The export consequences of a country’s leadership style are one manifestation of ‘soft power’. Soft power is a term first used by Joseph Nye (1990) to describe the ability of a country to do what it wants by means of persuasion rather than means of force (Nye 2004 provides more detail). ‘Hard power’ is the ability to coerce, and grows out of a country's military or economic might; soft power arises from the attractiveness of a country's culture, political ideals, and policies. “Soft power is … the ability to attract, [since] attraction often leads to acquiescence … soft power uses a different type of currency (not force, not money) to engender cooperation – an attraction to shared values ...” (Nye 2004: 6-7). With an enormous economy and the most powerful military in the world, the US currently has plenty of hard power. But what of US soft power, especially of late? One way to measure soft power is via surveys. Since 2006, Gallup’s World Poll has annually asked about a thousand survey participants in each of over a hundred countries a series of questions: “Do you approve or disapprove of the job performance of the leadership of China/Germany/ Russia/the United Kingdom/ the United States?” The Gallup data give a clear and intuitive picture of a country’s soft power, that is, its attractiveness to foreigners. The popularity of the Obama presidency outside the US appears clearly in Figure 1. The plots presents average views of non-Americans about US leadership between 2006 and 2017. Approval of US leadership has swung dramatically – it improved substantially between 2006 and 2012, and declined markedly between 2012 and 2017. Obama was a popular president, especially by way of comparison with both his predecessor (George W. Bush) and his successor (Donald Trump). Job approval of US leadership jumped from less than 40% under Bush in 2008 to over 50% under Obama in 2009; similarly, it declined by over ten percentage points when Trump succeeded Obama in 2017. 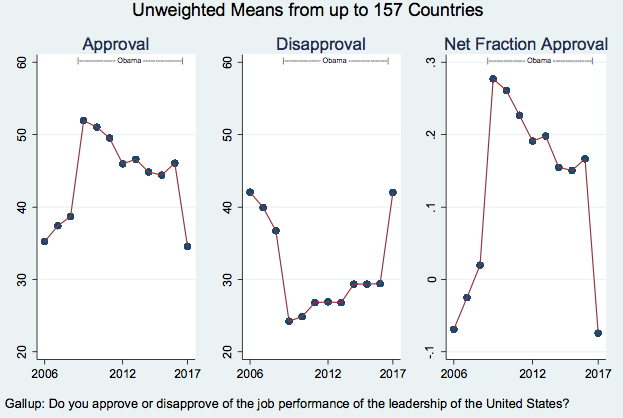 Consistently, average disapproval of US leadership fell sharply with Obama’s accession 2009 before rising sharply in 2017, as shown in the middle panel. The data in Figure 1 present averages across countries, and conceal considerable dispersion since different countries have different views of foreign leadership. I show this variation more effectively in Figure 2. The top-left panel of Figure 2 scatters foreign job approval ratings of US leadership averaged over 2009-16 (Obama’s presidency, on the y-axis) against the analogue for 2017 (Trump’s presidency so far, on the x-axis). The areas of the circles that portray individual country responses are proportional to (American) exports to that country. A 45° line (with slope of one) is provided for guidance; the data lie mostly above this line, indicating that countries tended to approve of Obama’s job performance more than Trump’s. Importantly, large US export destinations (observations with large circles) tend to be towards the top-left of the graph; these countries are not only important US export markets but approve little of Trump, especially compared to Obama. Similarly, the top-right panel of Figure 2 portrays foreign job disapproval ratings of US leadership. The fact that most of the observations lie in the bottom-right of the graph indicate that many US export destinations disapprove strongly of Trump’s leadership, though they disapproved little of Obama. The drop in foreign approval for leadership in 2017 compared with the eight previous years is a phenomenon unique to the US. This is illustrated in the bottom panels of Figure 2, which are in every way analogous to the upper panels but portray German instead of US data (Germany approval/disapproval/export data are substituted for US data). 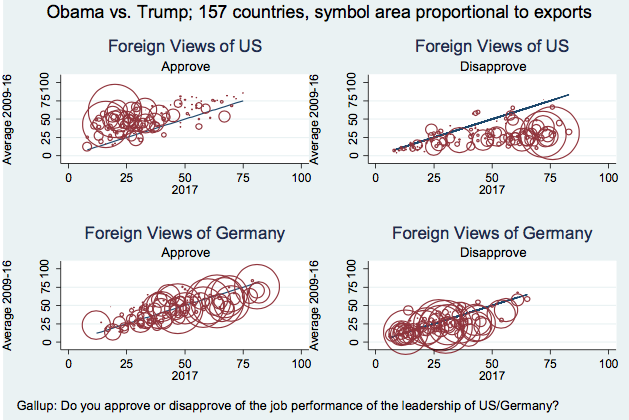 Foreigners, especially those which are big German export markets, approve more/disapprove less of German leadership, as shown by the fact that the data are disproportionately in the top-right/lower-left area of the lower-left/right graphs. Perhaps more striking is the fact that the data are approximately spread along the 45° line; foreign perceptions of German leadership have not systematically changed. So the Gallup data provided a reasonable picture of soft power. But while the intuitive patterns in the data are reassuring, there is little reason to presume that there is any quantifiable link between exports and soft power. My most recent research asks whether countries are affected in any tangible way by fluctuations in soft power (Rose 2018). In particular, I test whether changes in foreign perceptions of soft power affect actual export sales, all else equal. To do this, I use a standard data set and a plain-vanilla ‘gravity’ model of international trade to account for other influences on bilateral exports besides soft power (details are available in Rose 2018). In an econometric way, this enables me to ask whether a country whose leadership is considered appealing by potential importers experiences systematically higher exports than countries whose leadership is repellent, ceteris paribus (using the gravity model to hold other things constant). As my measure of soft power, I use the Gallup survey results. When I estimate the econometric model, it works well; most variation in exports is well and sensibly explained by the underlying gravity model. This means that the threshold for any additional export determinant is high. But, it turns out that the additional effect of soft power is still strong. Very strong. An increase in netGallup approval has a large positive effect, and is statistically precise. This effect of soft power on exports is big – a decline in net fraction approval of one standard deviation (.33) lowers exports by around (.33*.91≈) 0.3%. Average net approval by foreigners of the US leadership declined from +16.6% in 2016 (Obama’s final year in office) to -7.4% in 2017 (the first year of the Trump presidency). This swing of 24 percentage points in net approval would be expected to lower US exports by (.24*.91*$1.45tn≈) 0.22%, or $3.3 billion. Even this calculation is conservative if countries that are large importers of US products also disapprove of Trump disproportionately, as seems relevant. Net approval of US leadership in both Canada and Mexico fell by more than 60 percentage points, and these are the US’s two largest importers, together accounting for over a third of US exports. To summarise, the evidence points to a powerful role of soft power in export determination, even after holding other effects constant through the gravity model. Exporters sell more exports to countries which approve more of the job performance of their leadership, even after accounting for other factors. Canada is likely to buy more from the US if the US exerts soft power over Canada. The effect of soft power on exports is economically large, given that swings in leadership approval are often dramatic. I conclude that Trump’s unpopularity outside the US dampens the demands for US exports. I conservatively estimate that the over 20 percentage point decline in foreign approval of US leadership between 2016 (Obama’s last year) and 2017 (Trump’s first year) lowered US exports by at least 0.2% or, over $3 billion. Nye, J (1990) “Soft Power”, 80: 153-171. Nye, J (2004), Soft Power: The Means to Success in World Politics, Public Affairs. Rose, A K (2018) “Agent Orange: Trump, Soft Power, and Exports”, CEPR Discussion Paper 13139.